Asthma affects approximately 300 million people around the world. In children, males have a higher asthma risk; in adults, females have a higher prevalence. Experts believe asthma results from various host factors, environmental factors, or a combination. Host factors include gender, obesity, and genetics. Genetic factors include atopy. Defined as a genetic tendency to develop allergic diseases, such as asthma and allergic rhinitis, atopy commonly is linked to an immunoglobulin E (IgE)–mediated response to allergens. Understanding asthma pathophysiology helps you understand how the condition is diagnosed and treated. Our knowledge of asthma pathogenesis has changed dramatically in the last 25 years, as researchers have found various asthma phenotypes. 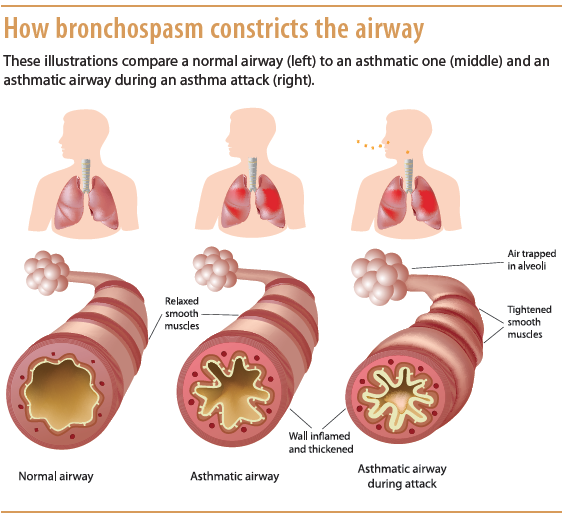 Asthma involves many pathophysiologic factors, including bronchiolar inflammation with airway constriction and resistance that manifests as epi­sodes of coughing, shortness of breath, and wheezing. Asthma can affect the trachea, bronchi, and bronchioles. Inflammation can exist even though obvious signs and symptoms of asthma may not always occur. Asthma also may lead to an increase in mucus-secreting cells with expansion of mucus-secreting glands. Increased mucus secretion can cause thick mucus plugs that block the airway. Injury to the epithelium may cause epithelial peeling, which may result in extreme airway impairment. Loss of the epithelium’s barrier function allows allergens to penetrate, causing the airways to become hyperresponsive—a major feature of asthma. The degree of hyperresponsiveness depends largely on the extent of inflammation and the individual’s immunologic response. Asthma also causes loss of enzymes that normally break down inflammatory mediators, with ensuing reflexive neural effects from sensory nerve exposure. Without proper treatment and control, asthma may cause airway remodeling leading to changes to cells and tissues in the lower respiratory tract; these changes cause permanent fibrotic damage. Such remodeling may be irreversible, resulting in progressive loss of lung function and decreased response to therapy. Asthma may be atopic, nonatopic, or a combination. airway inflammation and bronchoconstriction. Women who smoke during pregnancy may predispose their unborn children to higher IgE levels, causing hyperresponsiveness and asthma development. Exposure to pollution may have the same effect. Nonatopic asthma doesn’t involve an IgE response. It may have fewer obvious triggers and usually occurs in adults, possibly secondary to a viral infection. Asthma diagnosis goes beyond symptoms, such as coughing, chest tightness, wheezing, and dyspnea—and even beyond signs and symptoms that worsen at night and improve after treatment. Diagnosis may require pulmonary function tests (PFTs) and peak expiratory flow (PEF) measurements. With asthma, the ratio of forced expiratory volume in 1 second (FEV1) to forced vital capacity (FVC, also called FEV1%) typically declines. Asthma symptoms can be reversed by a rapid-acting beta2-agonist, such as albuterol, as measured by spirometry. The generally acceptable response to beta2-agonists is a 12% or 200-mL increase in FEV1 or FVC. PEF measurements not only aid diagnosis but also help clinicians monitor the disease. Clinicians must rule out other conditions that may decrease FEV1 and cause signs and symptoms that mimic asthma. These conditions include vocal cord dysfunction, gastroesophageal reflux disease, ischemic cardiac pain, chronic obstructive pulmonary disease, heart failure, upper-airway obstruction, cystic fibrosis, hyperventilation, and foreign-body aspiration. Viral respiratory infections may lead to asthma exacerbations or contribute to eventual development of the disorder. Asthma management involves both acute and long-term treatment. Medication selection hinges on the patient’s age, disease severity, and comorbidities. patients receiving certain asthma agents. Meant for short-term symptom relief, rescue drugs cause bronchodilation and are used mainly to prevent or treat an asthma attack. They begin working within minutes and may remain effective for up to 6 hours. Potential side effects include jitteriness and palpitations. Rescue drugs include ipratropium bromide inhaler (Atrovent), short-acting beta2-agonists, and oral corticosteroids. Ipratropium bromide, an anticholinergic, may be given in combination with short-acting beta2-agonists in some cases. Beta2-agonists used for quick relief include albuterol, levalbuterol, metaproterenol, and terbutaline. decreased ability to resist infection, and reduced growth in children. Used to prevent asthma attacks and control chronic symptoms, these agents include inhaled corticosteroids, leukotriene modifiers, long-acting beta-agonists (LABAs), theophylline, and combination inhalers that contain both a corticosteroid and an LABA. These drugs may take days or weeks to reach maximal effect. Leukotriene modifiers help prevent symptoms for up to 24 hours. LABAs, which may last up to 12 hours, usually are given in combination with an inhaled corticosteroid, because when used alone they may lead to a severe asthma attack. LABAs also are prescribed to prevent nocturnal asthma symptoms, such as coughing. Theoph­ylline, given orally, acts as a bronchodilator and also is used to treat nocturnal symptoms. Patient education is crucial in asthma management. Teach patients and their families how to use a peak flow meter, optimize environmental controls, and recognize asthma signs and symptoms. Stress the importance of smoking cessation. Urge patients to receive annual vaccinations, as asthma increases the risk of complications from respiratory diseases, such as pneumonia and influenza. Johnson J. 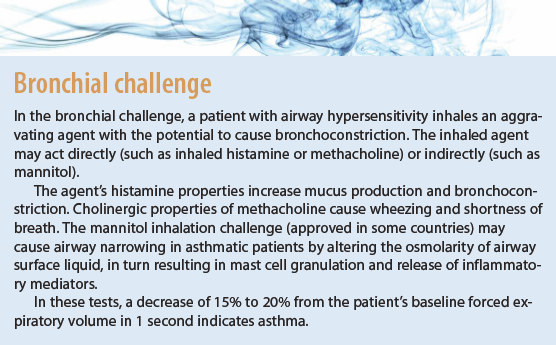 Asthma assessment tips. J Nurse Pract. 2010;6(5):383-4. Martinez FD, Vercelli D. Asthma. Lancet Sem. 2013;382(9901):1360-72. National Asthma Education and Prevention Program. Expert Panel Report 3: Guidelines for the Diagnosis and Management of Asthma. Section 2: Definition, pathophysiology and pathogenesis of asthma and natural history of asthma. Bethesda, MD: National Heart, Lung, and Blood Institute; 2007; 1-24. Pruitt B, Lawson R. Assessing and managing asthma: a Global Initiative for Asthma update. Nursing. 2011;41(5):46-52. Shari J. Lynn and Kathryn Kushto-Reese are instructors at the Johns Hopkins University School of Nursing in Baltimore, Maryland.